Trump's Mar-a-Lago Trips Likely Will Shift To New Jersey As Summer Heats Up The president likely will skip summer's heat at his Florida resort, instead going to his golf club in Bedminster, N.J. Some there are excited, but others worry the visits will overwhelm the town. 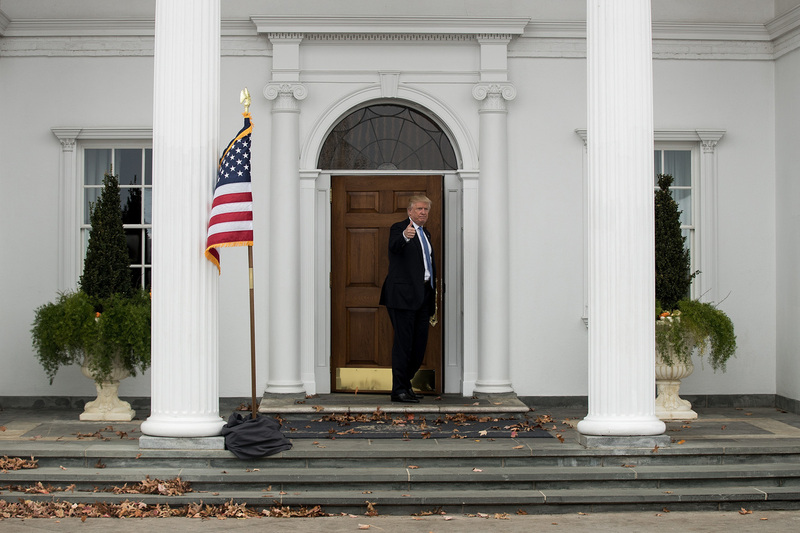 President Trump heads back inside the Trump National Golf Club clubhouse in Bedminster, N.J., on Nov. 20, 2016. "Are we going to get crowds that are going to come out, that are going to want to camp out in front of the golf course?" the town's mayor Steve Parker asked. "I don't know yet. I kind of hope not, because I think we'd just like to keep things as quiet as things usually are in Bedminster." Parker doesn't know how often President Trump will visit — he's been at Mar-a-Lago about half the weekends he's been in office — or what kind of reception he'll get when he does. But the town of Bedminster has already asked the federal government for help. In December, Parker sent a letter to his congressman that estimated the cost of police overtime for the president's anticipated visits to the Trump National Golf Club in Bedminster this summer at about $300,000. "We haven't gotten anything concrete," Parker said. "We're still waiting to see how that's going to work. But it's not for a lack of asking on our part." Parker does expect that his own business, running the local Somerset Airport, would take a hit. When Trump is in town, planes would be grounded because there's a no-fly-zone around any sitting president. Some local merchants are thrilled about having the weekend White House in the area, including Steve Desiderio, who owns Desiderio's Market and Catering on Main Street. He recalled when the Trump transition team spent a weekend in November interviewing potential Cabinet members at Trump National Golf Club. "When he was in town it really helped the business, with a lot of the Secret Service and the reporters and people coming in," Desiderio said. The golf club, which is hosting the U.S. Women's Open tournament in July, is tucked away in New Jersey horse country, about an hour west of Manhattan. It's surrounded by open fields and forests. The front gates to the club, the former estate of automaker John DeLorean, are understated. If you don't know what you're looking for, you could drive right by them. 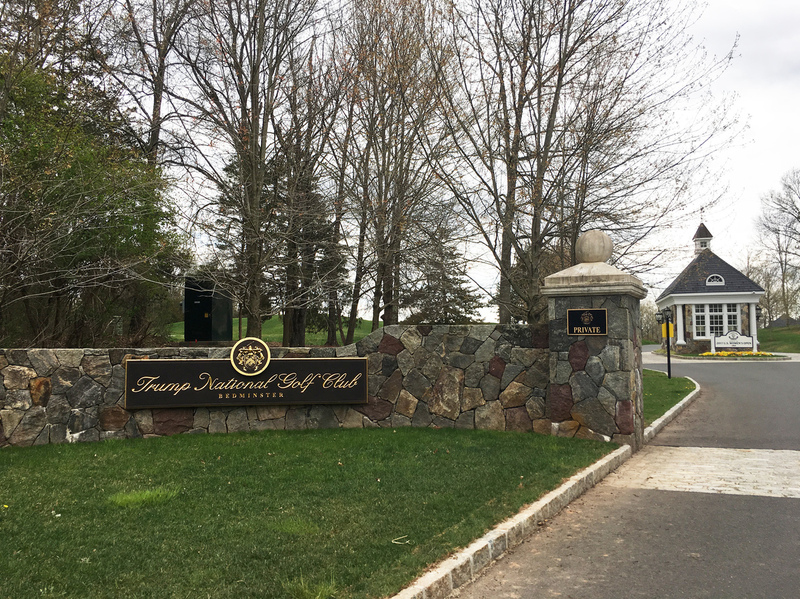 Trump is expected to visit the Trump National Golf Club in Bedminster, N.J., more frequently now that the weather is warmer. "Originally people came out here from New York because they used to want to do riding," said Dorene Longell, co-owner of the Bedminster Florist on the town's quaint Main Street. "They wanted to be in the country that reminded them of England, or a quieter place." Longell said that she voted for Trump, and that a lot of her neighbors in this Republican-dominated area did, too. "We like having him. I like having him," she said. "How many people in the United States can say, 'Oh, the president has a home in my backyard?' Not that many." The residents of West Palm Beach, Fla., can say just that — and some aren't as enthusiastic as Dorene Longell. Many there will be relieved when the president's Mar-A-Lago club closes for the season next month, bringing an end to traffic and other headaches associated with his frequents visits. During Trump's November visit, the small Bedminster township police force went into high gear, directing traffic and preparing for big crowds. Some residents worry about what would happen if the president visits Bedminster as often as he went to Florida. At a township meeting in March, Jane Schumann said she has friends in West Palm Beach who complained that their taxes may go up because of the president's frequent visits. "I just think it's extremely unfair if the burden becomes a Bedminster taxpayer burden," Schumann said. "And I want to go on record saying that."